One of the joys of reading is the paradox of its at once being so personalised and private and yet holding a base for shared experience and understanding. Few books exemplify this in such a multi-dimensional form as Chris Mould’s astounding new work, ’76 Pumpkin Lane’ which combines some of the most innovative paper engineering together with Mould’s signature brooding style of building and beings. A short introductory text places the structure of ’76 Pumpkin Lane’ into context and provides a tantalising glimpse of the gory and grotesque inhabitants found therein. Character exposition is limited to a scant few details, but this is purposeful, allowing readers to act-out their own stories and scenarios using the figurines included within the setting that Mould has created. Each of ten rooms sport different accessories and accoutrements allowing for imaginative interaction and play. A victory for the delight of visceral fears made visual! 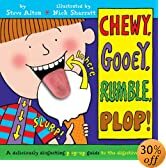 Following the processes of digestion and excretion literally from beginning to end, ‘The Gooey Chewy, Rumble, Plop Book’ is a cavalcade of consumption! Taking as its premise the ingestion of ice-cream ‘ and sporting a highly tactile tongue that can be made to waggle in a most disconcerting manner ‘ the book takes us on a voyage around our extraordinary bodies, highlighting key learning areas such as taste, superb stomach statistics, an amazing account of absorption, and a double-page plop-out that will have readers doubled up with laughter! The joy of this book is the meticulous detail that has been afforded to its production. Innovative paper-engineering together with carefully penned descriptions of the processes encountered as parts of digestion and excretion make this an active ‘ and thereby memorable ‘ learning experience. A victory for the voyage of discovery! The start of a new term at the Mammoth Academy is immediately greeting by a pledge on the part of the humans from Cave Skool that ‘We is gonna git you!!’. So it transpires that another epic battle between Mammoth and mankind is initiated. Arabella’s studious nature leads to her developing ‘The Sparklebang Code’, this when combined with the Mammoth Mammoth, a giant model that pupils have made at the academy leads to an explosive solution as the humans encroach upon the Academy. The inimitable and illustrious Layton’s mixed media illustrations perfectly complement the anarchic irreverence of this latest installment about the Mammoths; fun, friendly and furiously fast-paced, readers will find themselves caught in a frenetic race to the feast at the finale! Mouse, familiar to readers of Cathy Cassidy’s debut novel, ‘Dizzy’, makes a reappearance and meets with his counterpart in Cat in this latest novel by Cathy Cassidy. The spirit of egalitarianism alongside soulful attempts at self-expression and personal evolution run through ‘Lucky Star’. The novel opens as Mouse, Martin Kavanagh, writes a letter to his headteacher, Mr Brown, apologising for the graffiti art he daubed on the school premises. Mr Brown, however, is unconvinced as to the sincerity of the apology. Following a meeting with his social worker, Mouse bumps into Cat, whom it transpires is a petty shop-lifter. The two of them form an alliance and are able to relate parts of their past to one another. Together the pair help Mouse’s mother re-establish the Phoenix Centre, the drugs rehabilitation centre in the ironically named ‘Eden Estate’, following its destruction in an arson attack. Cat and Mouse become convinced that the vicious circle the estate is trapped within can be broken and so they embark upon carrying out vigilante style retribution. Whilst this is, in part, successful, it throws them into the arms of the police whereupon the secrets they have kept concealed from one another are revealed with huge consequences. The phoenix motif in the novel is particularly apt to this story about rebirth and regrowth. Cathy Cassidy has paired the importance of responsibility against the essential nature of self-expression in this heart-warming, life-affirming tale. Similar in tone and tempo to ‘Beauty and the Beast’ and in feel and form to ‘Wuthering Heights’, Paul Gallico’s modern-classic, ‘The Snow Goose’ is sumptuously re-defined in this sumptuously produced edition published by Hutchinson. ‘The Snow Goose’ follows the plight of Philip Rhayader, an artist living out a solitary existence on the Essex Coast. Blighted by a physical deformity that distances him from the society surrounding him, his tenderness and love find purpose only through nurturing injured wild-fowl back to well-health. An injured snow goose brings the feisty young Frith to Rhayader, and together the two of them nurse the creature. The other-worldly aspect of the Great Marsh is purged by current affairs as news of the war and the situation facing soldiers in Dunkirk spreads. With this, human devastation infiltrates the ebb-and-flow of the natural, wild environs of the marsh. Rhayader resolves to sail his boat across to Dunkirk whereupon he plans to rescue the soldiers stranded upon the beach. From this point, the remainder of the story becomes piecemeal, gathered from a variety of sources and puzzled together arriving at a conclusion laced with pathos, unfulfilled desires and things unsaid. The salt-sting of the sea air and its desolation are captured brilliantly by Angela Barrett’s majestic illustrations which evoke the wild untamed, atmosphere of the book with a raw, untamed power and grace that proves entirely equal to this haunting tale. As well as being ubiquitous in the children’s literature field, Enid Blyton’s legacy has been highly influential. With around 8 million copies of her various titles sold annually and a body of work that embraces some seven-hundred-books, Blyton was and remains a true phenomenon in children’s publishing. Purporting to guide readers through the ‘mysterious and inventive life of Enid Blyton’, Duncan McLaren’s ‘Looking for Enid’ documents the geography that lay behind much of her life and attempts to place this in context of her work. The major initial problem with this line of thinking is that the hypothesis it posits is reliant upon the weight of emphasis and significance that McLaren places upon particular works and characters at the exclusion of others that are in contravention of his pre-defined ideologies, making this a curiously single-sided work. Only those out of the many tunnels and secret passages that fit with McLaren’s slightly aslant psycho-analytic reading, only those towers which fit with the autobiographical detail he feels permeates the works are granted accord, the remainder meanwhile are dismissed. In spite of this, parts of McLaren’s work are revelatory and parts of his research ‘ where it is grounded and does not involve flirtatious theorising that seems to serve its apparent primary purpose, the titillation of his travelling companion Kate ‘ are to be applauded. This, however, is too dilute and embedded within too much supposition to be of major interest. With the literary equivalent of a nervous-twitch, McLaren appropriates Blyton’s characters and lives out parts of his own thoughts, feelings and desires and those that he projects upon Blyton herself. This occurs most inappropriately when Enid and first husband Hugh have an imagined bed-time conversation as rabbits, Binkle and Flip discussing the hope for a fully-developed uterus’ ‘Oh, it wouldn’t have to be a fully developed one. Not an arterial road running right through me! But perhaps I could wish for the uerus of an 18-year-old girl. Do you think that would be too much to ask for?’ It becomes hard not to recoil! Blyton’s position within the children’s literature world and the sheer mass of work she produced means that further consideration ‘ and that which travels beyond the shifting trends and tectonics of political correctness ‘ is needed, but this title is unequal to that. Barbara Stoney’s official biography is far more engaging, more precisely written and of lasting interest than the current work. Portobello must be praised for the high-production values on this work, however, whether the self-indulgent content in its current form warranted publication is certainly questionable. Tabitha Suzuma has the rare skill to breathe such life and motivation into her characters that they burn bright and indelibly upon the brain. In ‘From Where I Stand’, Raven is suffering severe trauma that drives a wedge between himself and others. His resultant vulnerability leads to his being taunted at school. Raven’s grief, despair and guilt moves through stages as the novel progresses. He denies the reality of what has happened, weaving around himself a protective film of lies and half-truths. Though the stigma of mental health problems are encountered through the levels of misunderstanding and of miscomprehension that surround Raven, the mind is depicted here as resilient, strong and in a process of renewal and of resolution. Suzuma’s willingness to draw from a reservoir of biographical experience to colour her characters with credibility makes this a courageous novel and, in an age when one in four people experience mental health problems throughout their lives, a highly worthwhile and contemporaneous one also.